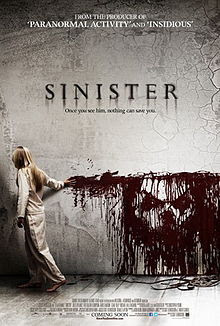 Sinister (2012) is the kind of horror movie I have a difficult time assessing, and I left a viewing of it deeply conflicted. The first hour or so of this horror film from Scott Derrickson is beyond reproach: serious, grim, legitimately-disturbing, and very original in terms of visual presentation. But the movie’s last act falls apart, and all the carefully-generated suspense just bleeds out of the proceedings. By the time of the film’s final and lame bump, Sinister has plummeted so far from its apex of terror that you’ll feel deflated and also a little angry. Greatness was within its grasp. So, do I champion what’s good about Sinister, or criticize the fact that things fall completely apart in the third act? As is my wont, I’ll pay attention to both factors in this review, but I can’t lie about the bottom line: the weak, discordant ending casts a retroactive pall over a film that might have been in contention for the title of genre classic. 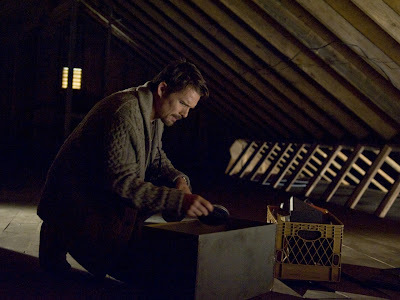 In Sinister, a once-famous author Ellison Oswalt (Ethan Hawke) moves his family into the home where a terrible crime recently occurred. In the backyard of the Oswalts’ new property, a family was hanged by an unseen assailant. One child survived the hanging, but has vanished entirely. While Oswalt’s son, Trevor experiences night terrors on a regular basis and his daughter Ashley begins painting weird murals on the walls, Ellison investigates the hanging in hopes of writing a follow-up best-seller to his literary calling card, Kentucky Blood. Ellison is unexpectedly assisted in this endeavor by the discovery of a crate in his new home’s attic. Inside the crate are several old 8 mm film reels, all “home movies.” These amateur recordings, however, are filled with horrific murders. Technically, they are snuff films. One, “Pool Party ‘66,” reveals a family being drowned in a swimming pool. Another, “Barbecue ‘79” shows a different family being burned alive in its car. “Lawn Work ‘86” showcases a family bloodily murdered with a lawnmower, and “Family Hanging Out, ’11,” shows the previous homeowners being hanged.” Sleepy Time ‘98 may be the most disturbing of all, as it showcases a family murdered while asleep, throats slit on-camera. In one of the films, Pool Party ’66, Ellison catches sight of a strange, demonic-looking figure in the pool. Further examination reveals this being’s presence at each of the crime scenes. Also at each crime scene: some sort of demonic iconography. When Ellison asks a local professor, Jonas (Vincent D’Onofrio) about the occult symbols, the academician reports they are associated with a pagan God named Bughul…a god who steals children and -- over time -- devours their very souls. The greatest horror movies involve some kind of metaphor of sub-text that grants the film additional meaning and depth. Sinister very much concerns what it means to be a writer, and how a writing career -- if not successful -- can actually tear a family apart. In the film, Ellison doesn’t want to quit writing, even though family finances are grim, and even though his family is in mortal danger. Why? He still remembers the “high” of Kentucky Blood’s release, when he went on TV talk shows, won awards, and was a figure of some national repute. Ellison feels that this current case is now his “shot” to have all that celebrity again. He wants to take that shot, no matter the consequences. And importantly, he thinks there’s nothing he can’t handle. As a professional writer since 1996, I very much appreciated this thematic through-line in Sinister. Every author who has struck with writing for any significant span -- and witnessed economic fortunes rise and fall with each project -- will recognize some of the hard yet truthful conversations shared by the husband and wife here. Ellison’s wife urges him to teach or edit to supplement their income, but he doesn’t want those careers. He wants to write, to do things his own way, on his own terms. In the end, however -- as his wife tells him -- it is Ellison’s family that must sacrifice so he can attempt to achieve his dreams of fame. Not coincidentally, Sinister also features a demon stealing away children’s futures, and that’s the key metaphor or sub-text. That soul-sucking demon who demands almost constant sacrifice is actually the writing career that takes Daddy away, and limits family resources. These moments of husband/wife frisson in Sinister are powerfully observed and uncomfortable true. Writing is a solitary profession, and one lacking stability and security. A writing career can skyrocket and flame-out in a surprisingly short span. One success can fool you into thinking you’ve made it, but then every successive time up at bat (or in print), you have to make it again, all over again. You’re only as good as your last success. Ellison is an egotistical man, to be certain, but not a bad man. At night, when not watching the horrific snuff films, he watches old VHS recordings of his TV talk show appearances, and narcissistically revels in his image, his celebrity, and his wit. Fame is like a drug to Ellison, and we see (though his constant whiskey drinking) that he is an addictive personality. For some reason, the approbation of the media feels more real and important to him than his family’s love. He craves it. Hawke is intelligent and interesting as Ellison, and the actor carries almost the entire movie on his shoulders. The movie, however, lets Hawke down in the last act, when it requires for Ellison to learn from his mistakes and -- with his family at stake -- he doesn’t. Instead, he acts incompetently. Without revealing too many specifics, Sinister’s last act requires Ellison to ignore important phone calls and voice-mails from a deputy for a long span, and then relapse into behavior that he explicitly has been informed will re-conjure Bughul. At this point, Ellison has given up writing his book, so there is no rational reason for him to go down this road. It’s not like he does it on a whim either. He sits down and cuts together film footage from every Bughul home movie, a time-consuming activity that would offer any sane person plenty of time to reconsider. So the Sinister screenplay switches over from clever and closely-observed to cruising on genre auto-pilot…all in time for the catastrophic finale. And yet by the time of that switch-over auto-pilot, Sinister has also proven itself a profoundly intriguing found-footage-styled horror film. Much of the movie’s set-pieces involve the home movies, shot over various decades, and featuring the horrible murders of whole families. These videos look authentic and real to an alarming degree, and are absolutely disturbing. The moment in which Elliot first detects Mr. Bughul in one of the films is also a real seat-jumper. Bughul looks horrible and alien and wrong, and yet, at the same time, real. The home movies in the film -- literally found footage -- are unblinking in their commitment to scaring audiences, and to transgressing beyond standard movie decorum. And then it all goes south. One scene late in the film features a shift-of-perspective that reveals ghostly children all around Ellison, in the murder house. The revelation of their presence -- made manifest with child actors in ghoulish make-up, trying to make “scary” faces -- diffuses the real-life horror of the Bughul movies, and even his inexplicable presence in them. Then, Ellison behaves irrationally and inexplicably, as I noted above, and fails to safeguard his family. The coup de grace is the ending. Sinister culminates with one of the worst sequel hooks I’ve ever witnessed. The grotesque Mr. Bughul pops his head into the frame, essentially mugging for the camera. Until the last act, Sinister is indeed imbued with an air of the, well, sinister. And that balloon is punctured abruptly by the suddenly comical-appearance of Mr. Bughul as a kind of Freddy Krueger-like ringmaster. At this point, we’re in no mood to laugh, and not easily amused. The ending is egregiously off-tone, and it irreparably damages the film. Horror movies sometimes end darkly, with a failure to kill the monster, or the death of a protagonist. But the catastrophically unhappy ending in Sinister undercuts Ellison’s very journey as a character. He finally learns that his family is more important to him than his writing, but then still ends up dying. So everything he learned is, essentially, for nothing. And on top of it, Ellison isn’t the only one who dies because of his behavior. His entire family dies, and his daughter gets her eternal soul taken by Mr. Bughul. Sinister’s ending isn’t only bleak…it’s the bleakest of all conceivable endings. So, given the seriousness of it, why should Mr. Bughul pop up smiling at the end of the movie -- why-so-serious?-style -- like Sinister is some sort of light-hearted genre lark? It isn’t. The movie has showcased extreme violence and horror, aimed right at suburban families. Children drown. Throats are slit. The movie is about the corruption of innocence and the destruction of the hearth and home. This is not light-hearted material in the slightest. Again, it’s not that I object on principle to movies with dark or downbeat endings. Don’t Look Now (1973) is one of my all-time favorite horror films, for example, and it features an incredibly dark denouement. But Sinister can’t seemingly commit to its overwhelming sense of darkness, and goes for the lame sequel hook and the last minute, jokey appearance of Bughul. Honestly, I would almost have preferred it if Sinister had been poorly-done, or lacking in conviction all along, because then, at least, the final act wouldn’t serve as such a grievous, tonally-misshapen disappointment. So Sinister is a horror movie simultaneously good enough to get your hopes up, and bad enough to dash every last one of them. This was Sinister’s “shot,” to paraphrase Ellison, and the movie blew it! 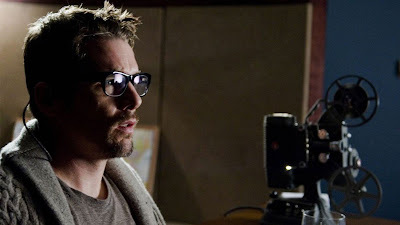 One thing you can say for Ethan Hawke's character in this movie: he's nowhere near as reprehensible and annoying as the guy he played in Reality Bites. Actually, I might have enjoyed that film if his character had met a grisly end come to think of it.